At 7:15 am, the sun rose over Blackpool, heralding the beginning of the second day of the South London Fellowship Band’s long-weekend visit to the north west of England. Band Secretary Rowland Little had thoughtfully arranged for all the band and supporters to have (if we wished) a full English breakfast in the Beefeater restaurant, which made for a relaxed and pleasant start to the day. With Carlisle being just under 100 miles north of Blackpool, it was planned that we would have a relatively leisurely drive up through the Lake District. All we needed was decent weather, which, fortunately, we did have. “Local lad” Rowland gave us a running commentary as we passed through Windermere, Ambleside, Grasmere, Thirlmere, enjoying the beauty of the hills and fells with their distinctive drystone walls and the Lakes. Major Paul Church brought an on-coach devotional thought and prayer and Bev Hudson told us something of the background and story of the Carlisle Corps Officers , Captains Mel and Steve Scoulding. 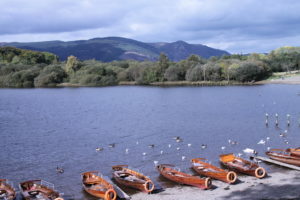 A lunch stop was taken at the delightful market town of Keswick, with some also taking in a stroll to view nearby Derwent Water. Friday’s frustrating journey up the M6 had meant that we were unable to check into our Blackpool hotel until after the evening programme. So we were all pleased when we arrived at our Carlisle hotel in good time, looking forward to an hour or so’s relaxation. But it was not to be. A mix up by the hotel’s administration meant that none of our keys were ready – and some rooms not prepared. So we were ushered into the adjoining restaurant for a free cup of coffee (much to the annoyance of the restaurant management) whilst this was all sorted out. Rowland remained calmly in control throughout, and eventually we all found our rooms – although some had barely 15 minutes before the coach was scheduled to depart again for the hall. A much-appreciated hot meal awaited the band in the Carlisle hall, and we were soon on the platform presenting our Saturday evening programme to a good-sized audience. 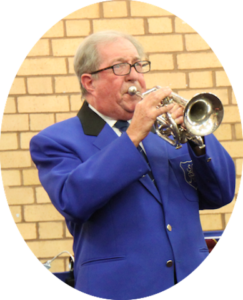 Our conductor, Darrell Scholes, had put together a basic programme format to cover both Friday and Saturday evenings, with the option to change a few items on the Saturday. So our Carlisle audience were able to enjoy some items not heard in Blackpool: the festival march Celebration(Condon), All the world is waiting(arr Sharman) and another festival march Britannia (Smith). Bev Hudson brought some thoughts from the Word of God (John 6), with the Male Voices singing, soon after, What will you do with Jesus? (arr Bearcroft). The major work was again Dean Goffin’s Symphony of Thanksgiving, which the band had first performed the previous evening. Published in 1952, this SA brass classic still “comes up fresh”, challenging conductors and players alike and thrilling listeners. A little before 10:00 am, the band and the Corps gathered together to commit the day to God in prayer, led by Adrian Horwood. Adrian had prepared a song sheet for all, so that each prayer topic voiced by a member of the band was reflected in a sung verse. Bridging the very short interval between the prayer meeting and morning worship, the band played an arrangement of the song Take my life and let it beby Kenneth Downie, entitled All for thee. At the outset of Harvest Festival Sunday morning worship, Major Paul Church challenged his listeners with “What are you expecting from today?” reassuring all that “his blessing will be among us”. 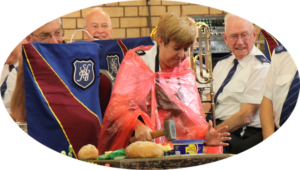 Major Paul later expertly “directed traffic” for the Carlisle Corps Harvest Altar Service – calmly coping with a song and tune mismatch! In giving his personal testimony, Rowland Little said that he left Carlisle (his home town) 53 years ago, whilst Tracy Wood (Chatham) demonstrated her skills as a YP and youth worker when she roped in three Carlisle young people to help her in an illustration involving some (very messy!) sandwich making. 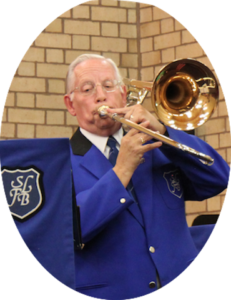 Carlisle Songsters (Songster Leader Ian Johnstone) sang Tom Fettke’s arrangement of Bow the knee,which brought much blessing – and demonstrated that quality singing is achievable when using a backing track. 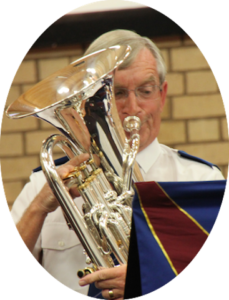 For its contribution to Sunday worship, the Band played Steven Ponsford’s A special moment. Published in April this year, this sensitive arrangement is based on the John Larsson melody God’s Moment. Roger Gadsden gave the bible message, based on Habakkuk 3 and Acts 14 (which John Rodgers had read earlier), affirming that, whether or not there is a harvest, we must “rejoice in the Lord” and “be joyful in God my Saviour”, who is sovereign and in control. 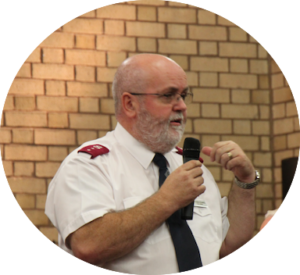 The need to get back on the road to London meant that it was not possible to schedule a second meeting/programme in Carlisle – but we did manage to squeeze in a Salvation Praise Wind Up. The band’s two contributions were Songs of Testimony(Bearcroft) and Music Maker(Graham). 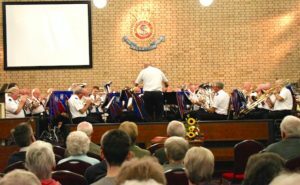 Carlisle Band (Bandmaster Gordon Hiscox) gave a crisp rendition of the March Medley Good Old Army(Simmons-Smith) from the American Band Journal, with the weekend concluding with both bands uniting in a golden oldie from 1934: Montreal Citadel (Audoire). A hasty buffet lunch then, at 1:45 pm, back on the coach for the long journey home from Carlisle. Apart from one minor delay on the M6, the return journey was without incident, with Brian Hillier taking the opportunity to pay tribute to former Fellowship Bandsman (and Gravesend colleague) Bill Davis, who was promoted to glory on the Friday morning when we left for Blackpool. (The sad news was conveyed to the band by the Gravesend CO when the coach called in there.) Our coach returned to Gravesend around 10:15 pm, finally arriving back at Tunbridge Wells an hour later. Throughout the whole trip, the band had been in the safe hands of our coach driver, Colin Richardson. 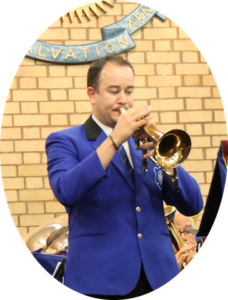 A round trip in excess of 750 miles, with Colin fitting in playing 1st Cornet in between driving duties. Many, many thanks Colin.